Other than an intermittent convoy of trucks it was just us, the sand dunes and a few patches of ankle high shrubbery as we drove through the Turkmen desert towards our most anticipated destination on this epic trip. Just after the scattered remains of the town of Darvaza which was demolished on command of the President, a beautiful modern road bridge stood alone beside the road. Complete with barriers and street lights, we came to the astounding realisation that there was no way to drive on or off of it. A couple of kilometres down the road from this memorable example of modernity a dusty sign pointed west, and opposite the sign a variety of tracks led towards the sand dunes to the east. Following the tracks we crossed a small ridge at which point the tracks disappeared and we proceeded to skid through the loose, deep sand. We seemed to be going around in circles, with no land marks besides continuous sanddunes, but eventually we crossed a narrow ridge which dissected two sandy mounds. Reaching the crest, we descended the other side and were instantly struck speechless by the fierce glow emerging from the giant flaming crater that was suddenly visible on the plain in front of us. Completely awestruck, we jumped out of the car and ran down the valley towards the flames. As we neared the edge of the crater, the enormity of this unnatural phenomenon baffled us. In 1971, during the reign of the Soviet Union, a failed exploration of Turkmenistan’s vast natural gas reserves had resulted in an explosion and thus, a crater. The amount of gas escaping from the ground was more than they’d experienced before, and hoping to curb its seeping into the air, they set it alight. With no grasp though of the sheer quantity that was bleeding from the ground, it hadn’t just burnt off as expected, and now this giant crater, 70 metres in diameter, has been on fire for over four decades. Instinctively drawn to the unguarded edge, perfectly aware of the imminent danger yet disturbingly immune to the fear, we saw for ourselves the reality in the imagery of the name colloquially given to the crater – “The Gates of Hell”. One gigantic flame swirled out from the centre of the hole, curling several metres into the air, while smaller flames seeped out from cracks in the rocky walls, blurring in the haze. We watched the burning crater all evening, from dusk to well into the night, amazed by the intensity of the colour against the night back drop. The heat was intense, and along with sand from the desert floor, it caught in the wind and threw itself at us, making for an uncomfortably dusty evening, but everything else paled in insignificant to the sense of elation we all felt from the red glow rising from the earth in front of us. Even our camp stove struggled to stay lit in the gusty wind, and by the time we got around to eating our dinner, it was mainly dirt on a bed of sand with a side of dust. We barely noticed. Had this man made natural disaster taken place in almost any other country in the world, it would not be the same experience. Most countries would put out the fire, bowing to the international pressure that would surely be placed on a government hosting such an environmental hazard. Many countries would leave it burning simply for the sake of attracting tourism, charging an extortionate entrance fee, littering the place with excessively friendly tour guides and vibrant information boards, and undoubtedly encouraging small business owners to set up shops selling cold drinks and a range of overpriced, tacky souvenirs. Tourism bureaus would probably build some sort of walkway over the top, there might be a photography service available, and of course the basic safety railing that would be required in keeping with safety regulations. Perhaps a clever investor would build some swanky apartment blocks, and it wouldn’t be long until an international hotel chain would set up shop advertising rooms with either “Desert View” or “Burning Gates of Hell View”. Not only had none of this come to fruition in Turkmenistan, but I cannot stress the awesomeness of being one of the few people who have been present at this unique scene. For a vast majority of the time there’s not a single soul present at the crater. It brings to mind the old adage of whether the tree falling in an empty forest still thuds as it hits the ground. Does the burning gas crater still burn if there’s no one there to watch it? You can read more about Ben and Eilidh’s journey here. Like what you see? 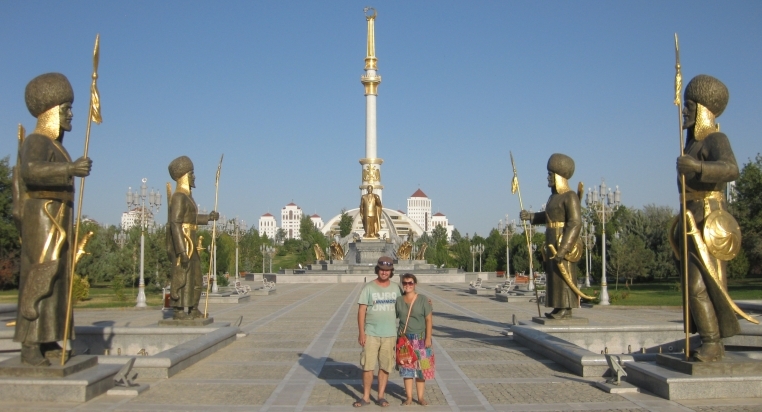 Travel with us to Turkmenistan.